UMBC Collegium Musicum is a performance ensemble dedicated to exploring and performing vocal and instrumental music from Medieval, Renaissance, and Baroque periods, sampling musical repertoires created between 800 and 1750. Open to all students with musical ability. Permission of instructor required. 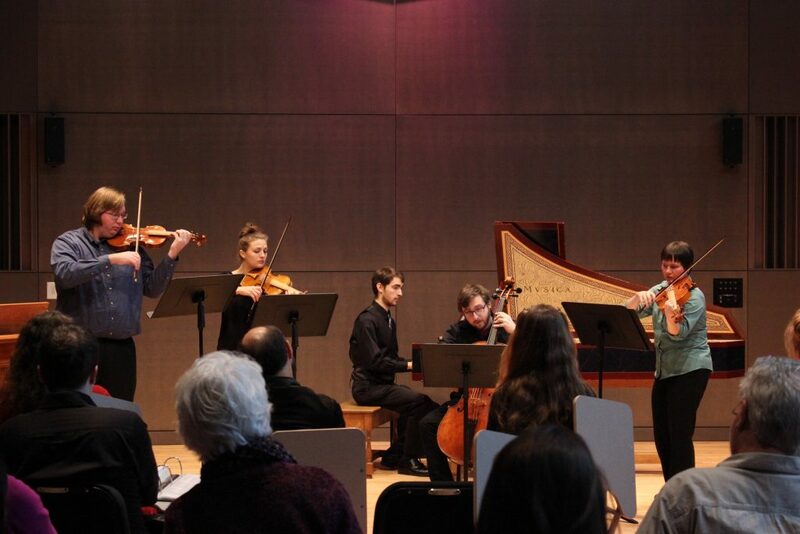 Under the direction of Dr. Lindsay Johnson, the UMBC Collegium Musicum is a unique ensemble in the Visual and Performing Arts program and is devoted to the performance of Medieval, Renaissance, and Baroque music. Members meet in ensembles of various sizes to study and perform period vocal and instrumental music. Students are given the opportunity to sing in a variety of conventional and extended vocal styles, and to play on historical instruments from the UMBC Department of Music’s collection of instruments, including recorder, crumhorn, racket, cornetto, shawm, harp, guitar, drum, chamber organ, harpsichord, and Baroque violin, viola, and cello. Emphasis is given to the study of musical style, performance practice, singing and playing one-on-a-part, and excellence in ensemble performance. This ensemble is designed for all students who are interested in performing and learning about the music and instruments of these periods. The course samples sacred and secular music from expansive and culturally diverse European regions ranging from Andalusian Spain to pre- and post-Reformation Germany and England, as well as Western-styled music written and performed in the New World. Participants not only collaborate on a broad variety of music, but also have the opportunity to study the music’s cultural influences through the use of primary source materials. For the music major or minor, the course functions as a complement to the required period history survey courses; as an elective for the non-music major, it provides perspective on the history of European art music through performance within a cultural framework.